Apple crisp is a traditional American dessert that I made twice in Hot and Cold Desserts class, once for practice, and again for the practical. I plated them both with caramel sauce and vanilla ice cream. While I made it in molds, you could also take the following recipe and bake it in a shallow dish. Crisp (American)= Streusel topping using granulated sugar. Crumble (British) : Streusel topping using brown sugar and oats. 1. Prepare 4 molds by covering the bottoms tightly with foil and place them on a sheet pan. 3. In a pan, melt the butter. Add apples, sugar, cinnamon, and nutmeg. 4. Cook the apples, stirring often, about 80% and until juice begins to evaporate. 5. Remove apples from pan into a bowl, set aside. 6. Prepare the streusel by placing the two sugars, flavorings, and butter in the bowl of a mixer fitted with a paddle and mixing only until fully combined. 7. Add the flour and mix until the streusel resembles crumbs, do not overmix. 8. When the apples are cool, place them in the prepared molds (avoiding putting the juice in the mold) and press down with the back of your hand. Be careful not to press hard enough to damage to apples, but enough to secure them in the mold. Sprinkle one layer of streusel over the top of each mold and press down to secure. Sprinkle a second layer of streusel over each mold. 9. Bake at 375 degrees for about 20 minutes, or until the tops are browned. 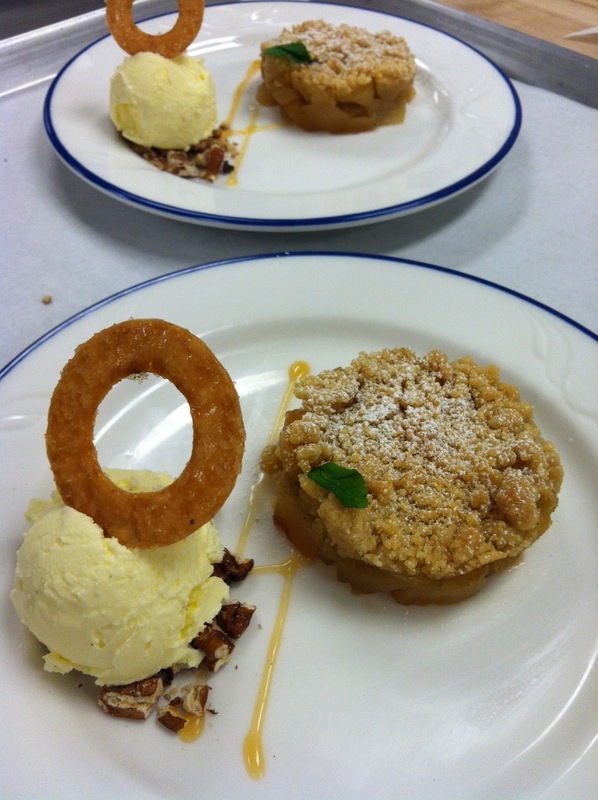 **Molds must be hot when removing the apple crisp, if cooled, place them back into the oven the heat before removing. Another American classic. Cobbler is a cooked fruit filling topped with biscuits or pie crust. The instructions direct that the cobbler be baked in ramekins, however, if ramekins are not available, cobbler can always be baked in a shallow dish. 2. Cut the cold butter into the dry ingredients with a dough cutter. 3. Make a wel in the center and add buttermilk, use hands to mix only until combined. So not overmix or biscuits will be tough!!! 6. Partially bake biscuits at 350 degrees for about 10 minutes or until they are able to move when the pan is shaken. 7. Meanwhile, while the biscuits are baking, place blueberries, sugar, cornstarch, lemon juice, and nutmeg in a in a tall pot. Stir constantly over medium heat with a rubber spatula. 8. When the mixture boils and thickens, take off the heat and gently stir in fresh blueberries. 9. 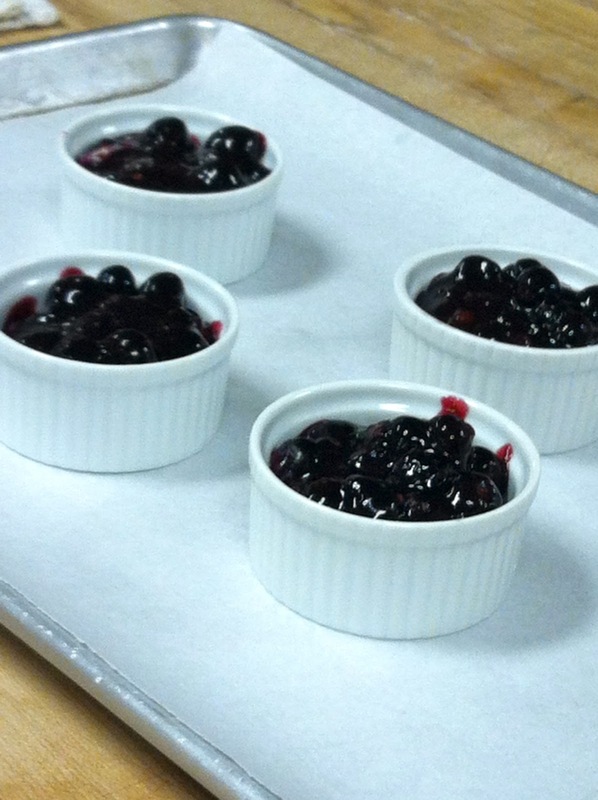 Scoop blueberry filling into ramekins. 10. With a round cutter or biscuit cutter, cut partially baked biscuits and place over filled ramekins. 11. Bake at 350 degrees for 30 minutes or until biscuits are golden and filling bubbles up.